Trauma is a rare cause of failure of drainage of the lower urinary tract. The most common mechanism is that of urethral disruption, although rarely foreign bodies can cause complete obstruction to voiding. The most common injuries associated with urethral injury are fall-astride injuries, pelvic fractures, penetrating or blunt trauma to the perineum, and fracture injuries of the corpora. Also, bladder injuries, such as intraperitoneal rupture, can cause failure to void. Most bladder injuries have a typical history of falling onto the lower abdomen while the bladder was full, or of obvious blunt or penetrating trauma. The management of all trauma patients should adhere to Advanced Trauma Life Support (ATLS) protocols (American College of Surgeons 1997), especially as a large proportion of these patients may have multiple injuries. Urethral injuries may not immediately be apparent on primary survey, although presence of blood at the urethral meatus should give a high incidence of suspicion. The patient may not be in AUR, as the trauma may have occurred when the bladder was empty, but the presence or absence of urethral trauma needs to be excluded if there is any suspicion of its presence. Prior to insertion of a urethral catheter, a retrograde urethrogram should be performed. 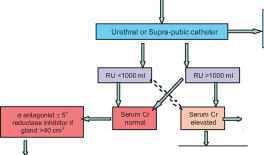 If any extravasation of contrast is seen, then a urethral catheter should not be inserted, and the drainage of the bladder should be established by suprapubic catheterization. If the patient is undergoing any abdominal or pelvic surgery then this can be performed synchronously; otherwise one needs to either wait until the bladder is full enough for percutaneous suprapubic cystostomy, or perform the procedure using ultrasound to show the position of the bladder (Morey et al. 1999; McAninch et al. 1996). Once bladder drainage is established, cystography can be performed to exclude concomitant bladder injuries. 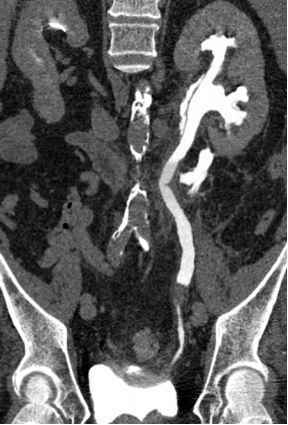 If the patient is suspected of having a bladder injury, and urethral injury is either unlikely given the mechanism of injury or has been ruled out on urethrography, then the first-line investigation should usually be computed tomography (CT) scanning with synchronous cystography. If this is unavailable, then plain x-ray cy-stography is usually sufficient to diagnose the need for surgical repair. Generally speaking, extraperitoneal bladder rupture with insignificant contrast extravasation can be managed effectively with prolonged ure-thral catheterization, typically for 10 days, with cystography prior to removal of catheter to ensure no ongoing leak. If intraperitoneal bladder rupture is seen, then surgical repair is needed. This should be carried out acutely, and postoperatively the bladder should be drained for at least 10 days, with some surgeons advocating both urethral and suprapubic catheters to ensure drainage and reduce the risk of complications. A summarizing algorithm for the management of (male) patients presenting with AUR is presented in Fig. 11.2.